So original and distinctive is the new Micra that Nissan has invented a new language to describe it. And our teacher will be David Lynch. Micra is no ordinary car, and no ordinary words can communicate it. In conjunction with TBWA/G1, Nissan has developed a break-through communications concept based around the fusion of existing words to create a whole new vocabulary, such as modern yet subtly retro – to make modtro. To underpin this departure from the ordinary, Nissan asked acclaimed film director David Lynch to direct the TV commercial. The Micra combines bold and distinctive design, with easy to use technology in a car engineered to be fun and easy to drive. TBWA/G1 was briefed to develop a campaign which would reflect this unique mix of values not only in terms of the Micra, but also in the broader context of the Nissan brand as a whole. 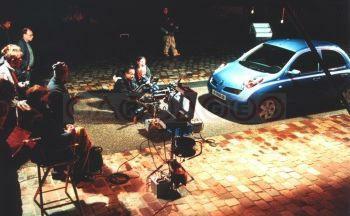 Agreeing to direct the advertisement, David Lynch commented, "I like the Micra, particularly the headlamps. They are like jewels. And I like the concept of ‘Do you speak Micra?’ I like modern and retro put together to make modtro – that’s a very good concept." Accompanied by a flow of Micra words spoken by giant blue lips – which recalls the atmosphere of Lynch’s Blue Velvet – the new Micra moves through an innovative environment lit by the French director of photography, Jean-Yves Escoffier (The Crow: City of Angels, Good Will Hunting, Les Amants du Pont-Neuf ). David Lynch: "I think it was [surrealist artist Rene] Magritte who put lips in the sky. This is a bit of the feel of those big beautiful lips speaking in a supermodern and very graphic city [Paris]." Lynch and Escoffier combined to use innovative technologies and an experimental approach to create an out-of-the-ordinary commercial. David Lynch said: "There is a lot of experimentation in the shooting, so we have many pieces to fit together. Plus, we are building things in 3D for this commercial. [For example] the lips have got to be isolated and finessed. " Chris Garbutt, Creative Director, TBWA/G1 Europe commented: "Lynch and Escoffier used a wide range of machinery and equipment to get the desired effect – from a helicopter, to another car, even a parachute to reflect light from the helicopter to the Micra. All this while fireworks were detonating under the Micra’s wheels. They also shot a lot of elements in different areas which have been blended together in 3D during post production. This commercial is like the new Micra car: a mixing of such different elements." The way in which David Lynch filmed the car is in a way reminiscent of the way he shot women in Twin Peaks and Mulholland Drive: with mystery, sensuality and with a sense of the bizarre. Chris Garbutt: "In a shot going down from the top of a building, Lynch introduced a woman character with red hair looking out of a window. It's these details that inspire a similar, cool emotion to Twin Peaks or Mulholland Drive." The new Micra campaign will be launched all over Europe, in up to 30 countries, from January 2003. It will cover all media: TV, outdoors, radio, and internet. It goes on sale from 15 January. Hmmm. Master of Diplomacy. I declare that advert ridiculeap. I guess the commercial is essentially lame, and the Micra doesn't look much different from the VW Beetle. Oh, c'mon, the shifting cityscape was good. Reminded me of "Dark City." have any of you seen the :30 Tv spot Lynch did for playsation 2? it was supposedly the most aired commerical aroudn the world -- it played everywhere but the USA. its pretty interesting. he shot it on a PAL pd-150. its pretty much a surrealistic atmostphere, where a man is walking though a maze and bumps into things; along the lines of a a one eyed mummy and a duckman. its floating around the net somewhere, its worth checking out. hes done a few spots for the sci fi channel as well that are pretty cool. i thought it was david lynch who did the one with the deer. thats a brilliant one for sure. "The item you selected is not available"
Lynch had actually directed the whole series of "The Third Place" commercials for the PS2. You can generally find them if you hunt on Kazaa. it was black & white and had a man with a duck-head in it, if i can recall it all fine. Eraserhead versus the painting-scene from FWWM actually. The haute couture shows are happening in Paris and we only wish that we could get a comment from director David Lynch about his take on the Chanel collection. (See him pictured with guests and a Chanel goody bag.) Maybe Lynch--known for his anachronistic, Jimmy Stewart-inspired patois-- would smile dreamily and say, "Golly gee, those ensembles sure were wowie!" Of course, the auteur must know his Alaia from his elbow. He was with style icon and model Isabella Rossellini from 1987 to 1991. Not to mention the fact that his films are much like couture shows: fanciful, irrational, and studded with more vibrant colors than a Pucci mini dress. The Stylephile also reports with glee that Lynch, 61, will direct the next Gucci commercial for its latest eponymous perfume. Gucci's parent company (for the fragrance only--should have specified, sorry--ed.) Procter & Gamble released a statement which indicated why the man who forever immortalized a severed ear in "Blue Velvet" should tackle the task: “Lynch was selected for his holistic ability as an artist, his professional experience and knowledge, his never-ending research for beautiful images, his use of music and his modernity.” Um, P&G neglected to commend his coif, a tornedo of adorable. What to expect? Well, the notion of a dab of perfume behind the ear would be particularly striking if that ear happened to be, say, unattached to a model and languishing on a grassy knoll. Lynch, 61, will direct the next Gucci commercial for its latest eponymous perfume. Gucci's parent company Procter & Gamble released a statement which indicated why the man who forever immortalized a severed ear in "Blue Velvet" should tackle the task: "Lynch was selected for his holistic ability as an artist, his professional experience and knowledge, his never-ending research for beautiful images, his use of music and his modernity." It remains to be seen how the director's qualifications will manifest themselves into a thirty-second spot: Gucci executives could wind up extremely dissatisfied, having hoped he'd return to them with something more akin to Nicole Kidman in a gauzy gown scampering across a moonlit roof into her lover's arms, as opposed to the director's somewhat less romantic vision of a naked dwarf sitting at the head of a conference table, dabbing his nether regions seductively with the new scent to a dark, jazzy tune by Angelo Badalamenti. lynch has directed tons of perfume ads, why is this one so special? i don't like how they say he's gonna make it wacky and weird, clearly they haven't seen his other perfume ads which are nothing but class. there's a bunch more i think i downloaded from lynchnet or somewhere (i'm sure mac knows). i can upload them onto youtube if people want. i am reminded of grace jones wrapped in dead branches and giving birth to a bottle of perfume in "boomerang..."